This section is from the book "Commercial Gardening Vol1", by John Weathers (the Editor). Also available from Amazon: Commercial Gardening, A Practical & Scientific Treatise For Market Gardeners. All the above forms of cells and many more unite in certain definite relations to one another, forming a tissue (fig. 9). Most flowering plants, Ferns, Lycopods, and Selaginellas have representatives of various forms of cells, wood fibres, and vessels in their tissues, and are spoken of as fibro-vascular plants, and constitute the most highly developed members of the vegetable kingdom. A mushroom is not a fibro-vascular plant, as it is made up entirely of branching threads of thin-walled cells. Fig. 9. - Cut illustrating various tissues. 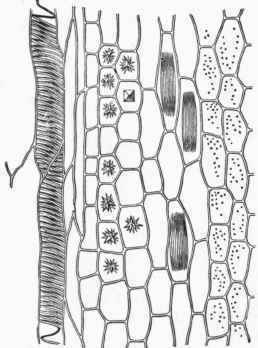 To the left Spiral Vessels, followed by long Conducting Cells. These are succeeded by Cellular Tissue or Parenchyma. In some of the square cells are Crystals of Oxalate of Lime. In the longer cells are groups of Needle-like Crystals called Raphides. To the extreme right are Pitted Cells.